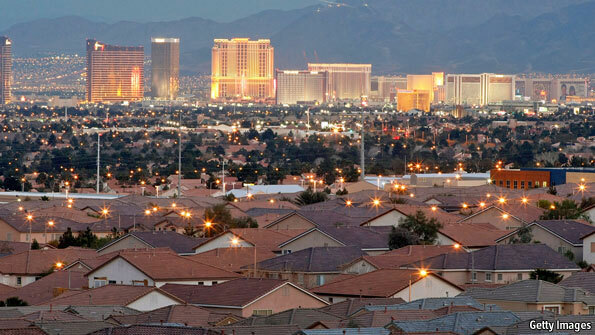 All this makes Las Vegas the most extreme example of the many cities in America’s sunbelt that grew rapidly thanks to the cheap and abundant credit of recent decades, only to suffer fearsome property crashes during the subprime crisis and the ensuing recession. The ten most foreclosure-afflicted cities in the country are all in Arizona, California or Nevada, notes RealtyTrac. Of the ten most foreclosure-prone states, only one—Michigan, with its car-related problems—lies outside the sunny south and west. As these places are now discovering, it is not just unfortunate property-owners who feel the reverberations of such monumental busts, nor are their effects confined to pocketbooks. The signs of the crash are everywhere in Las Vegas. The city’s outer suburbs are eerily quiet, thanks to the preponderance of unsold and foreclosed homes. There are few lights in any windows, and few cars on the roads. Banners and boards advertising hugely discounted housing flap and rattle mournfully in the desert wind. In North Las Vegas every second house on some streets carries a “For Rent” sign, offering rates of as little as $150 a month. One or two houses on each street have been boarded up and abandoned. Even on the city’s famous “strip” of cavernous casinos and high-rise hotels, the razzle-dazzle is marred by the grey concrete hulks of abandoned building projects. When a property crash becomes as pervasive as Las Vegas’s, explains Devin Reiss, a former head of the Nevada Association of Realtors (NVAR), it takes on a life of its own. Nasser Daneshvary of the University of Nevada, Las Vegas has found that the value of homes near foreclosed properties falls faster than the market as a whole, until so many homes are foreclosed that average property prices fall to the level of foreclosures. That, in turn, leaves more homeowners deeper in negative equity, saddled with mortgages that vastly exceed the value of their homes. NVAR reckons that as many as a quarter of those who suffer foreclosure do so by choice, to escape such a trap. Locals swap stories of cunning borrowers who buy second homes for a song before deliberately defaulting on their first mortgages. This sort of downward spiral, in turn, has a dire effect on local governments, which tend to rely on property taxes for much of their revenue. Clark County, which includes Las Vegas, expects its take from property taxes will fall by over a fifth this year. The problem is all the more severe, says Susan Brager, the chairman of the county commission, since demand for the services the county provides has risen amid the downturn. Local authorities also end up picking up the pieces when developers go bust or homes are abandoned, leaving fees unpaid, infrastructure to be completed and property to maintain. All of this ripples through the local economy. The construction business, once a mainstay, has withered. Local governments are trimming their staff. Some of those who have lost their homes or jobs have moved away: the population of Nevada started falling in 2008 for the first time in decades. And even those who stick around may be infected by the surrounding gloom. Alan Swinson, a builder living in North Las Vegas, says he has struggled to keep up with his mortgage in the past and is now determined to scrimp and save all he can to ward off future calamities. One recent study found, perhaps unsurprisingly, that high levels of foreclosure tended to drag down not just investment in property but also car sales. The knock-on effects go further, argues Terrie D’Antonio, the head of Help of Southern Nevada, a charity. Moving house can cut people off from their friends, churches, schools and community groups. Many have lost their homes because they have lost their jobs. All this leaves them isolated and depressed. And that can lead to drug and alcohol abuse, domestic violence, juvenile delinquency and so on. The number of people turning to Help about all these problems has jumped in recent years, Ms D’Antonio says. A 2009 survey of Latino families around the country whose homes had been foreclosed had similar findings: amid the stress, marriages broke down; family members fell out; children’s academic performance suffered. The proliferation of foreclosures has impinged on politics, too. Local politicians all have pet schemes to pep up the property market. Democrats at both state and federal level have tried to cast themselves as friends to struggling homeowners, voting for various measures to encourage forbearance by banks and tide over borrowers in arrears. Shelley Berkley, the Democrat who represents Las Vegas in Congress, huffs and puffs about Republican plans to shelve such schemes: “Talk about kicking people when they’re down!” But Republicans in districts with lots of foreclosures are more sympathetic to the over-indebted than the party as a whole. Joe Heck, the Republican who represents many of the city’s suburbs, recently cast the sole Republican vote to preserve one of the programmes Ms Berkley is so worried about. His predecessor, Dina Titus, a Democrat, was booted out of office last year amid anger about the state of the economy—yet another victim of America’s housing bust. Time to get out of Vegas.